A down market has a silver lining! It’s hard not to become nervous investing in a volatile market especially when your investments drop dramatically in a short time. Investing in shares is a rollercoaster! Fact. These are only paper losses until you sell. Are your investments any less valuable today than yesterday just because the market is pricing them 3% cheaper? Has the business of BHP had a 3% drop in earnings overnight? No, clearly not. However, where a stock is suffering over the medium term, and I’ll use BHP as an example again, it may well indicate an erosion of value in that business. For BHP, it’s the drop in the price of the commodities it sells. So don’t panic, just because of a swift drop when investing in a volatile market. It’s market sentiment, natural human herding behaviour. However, do watch the trend. If it’s down, there’s probably some underlying change in business metrics that is impacting value. The silver lining is that a down market makes everything cheaper. And we want to buy low and sell high. The lower the market is the more chance of upside in your investment, and that’s the return we are after. It’s impossible to time the market, to pick the bottom as the time to buy and sell at the top. The best approach is a regular drip feed into investments, so that you reduce the risk of a single lump sum purchase being at the wrong time, called market timing risk. We call this a RIP, a regular investment plan. The super payments your employer makes are a RIP. 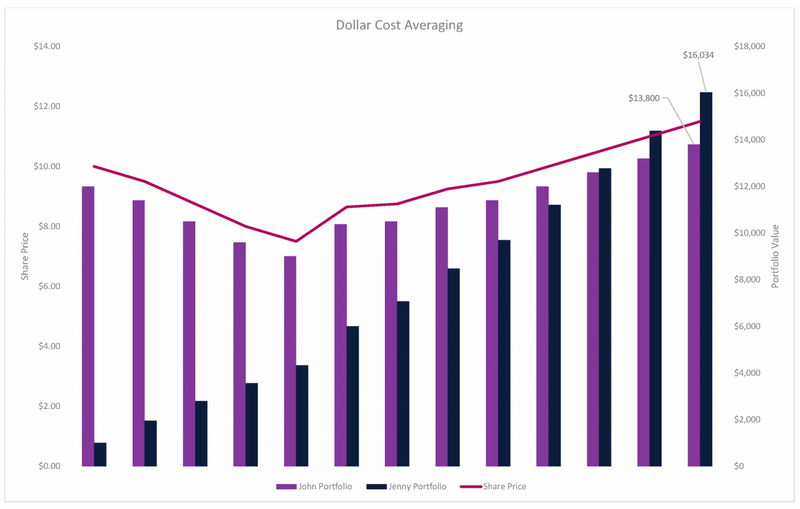 A RIP takes advantage of dollar cost averaging which is just a fancy way of saying that by regularly investing, you get an average purchase price, and market timing risk is much reduced. For a simple example, consider two investors, John & Jenny, who both have $12,000 to invest. John invests his entire $12,000 at once and Jenny invests $1,000 per month over the course of a year. In an up and down year, Jenny’s portfolio significantly outperforms John’s.